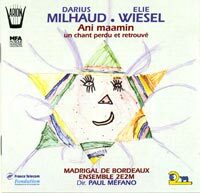 Description: Milhaud's antepenultimate work dates from 1972 and sets texts by Holocaust author Elie Wiesel. Although titled "cantata", the majority of this 72-minute work is spoken-word, punctuated by short choruses accompanied by an instrumental ensemble. At the climax, a soprano appears as "The Voice", with five dramatic interventions. The question of "why is God silent" during the Holocaust is the theme of the work and it has a cumulative dramatic power as long as you're willing to give it your full attention. French-English texts. Sharon Cooper (soprano), Michael Lonsdale, Bernard Freyd, Jean Négoni, Michel Herman (reciters), Madrigal de Bordeaux, Ensemble 2e2m; Paul Méfano. 1994 release.